Your representation at conventions and trade-shows should be a direct reflection of your company, goals and value proposition. Caswood can help you staff conventions at an efficient strategic level without interrupting your field staff. When creating a dedicated convention team, Caswood assists you by building in experience, continuity and continuous improvement in terms of customer satisfaction, lead generation and marketing presence. The Caswood Group specializes in staffing specialty educators or presenters for the pharmaceutical and bio-tech industry both nationally and internationally. CASWOOD can facilitate solutions for your event from event planning and design to staffing clinical educators or specialty presenters who are trained and knowledgeable in your product. We have the expertise to recruit, select, manage and train your staff for your next event or convention so that it is a success. We ensure that everything is in place, on time and supply post analytics. Our design team can help find the right events for your brand as well as deliver innovative solutions to engage your audience and increase attendance to your booth. Let Caswood be your partner of choice to staff your booth with knowledgeable professionals that are selected with the expertise that will match your needs. 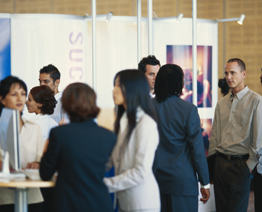 Caswood can recruit, select, manage and train your staff for your next trade show or convention. The right representation makes all the difference.